LEN - www.lankaenews.com | Mahinda too contracts kudu Duminda’s illness as he sees the CID ;alleges questioning him is political vendetta ! 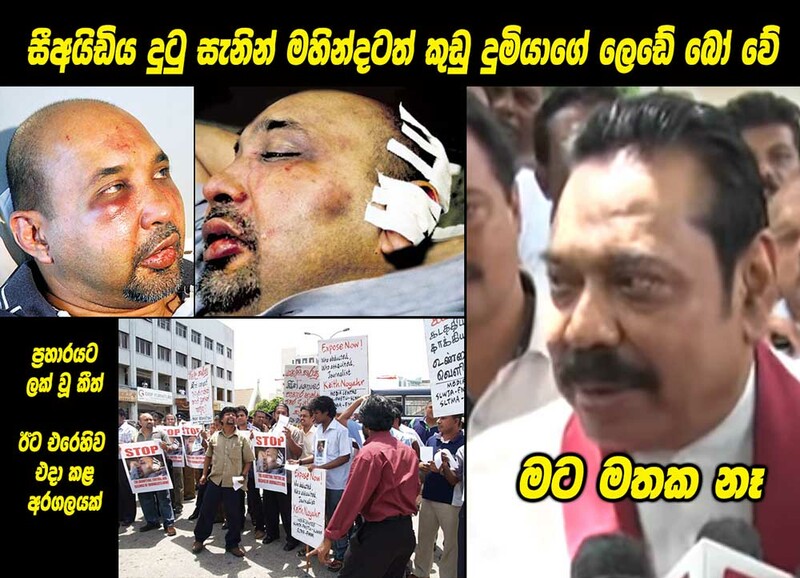 Mahinda too contracts kudu Duminda’s illness as he sees the CID ;alleges questioning him is political vendetta ! (Lanka e News 18.Aug.2018,11.45PM) Ex president and presently Kurunegala M.P. Mahinda Rajapakse who was evading the CID by ignoring the notices summoning him on four occasions for questioning in connection with the abduction and cruel torture inflicted on former deputy editor , Keith Leroy Noyahr of Nation newspaper on 2008-05- 22 was interrogated in his Bungalow at Wijerama mawatha on the 17 th , following which the statement of his was recorded . Though he was notified prior of the arrival of the CID , when the latter went there Mahinda was out and returned at about 11.30 a.m. Instead of facing the investigation into the abduction of a journalist , he made that a scene of his political exhibitionism . About 300 individuals including all the MPs of the joint opposition , supporters and Bhikkhus were present at his Bungalow . Many interpreted this ‘show’ as an unwitting display of his immense fear and guilt. When senior DIG Ravi Senaratne , Director Shani Abeysekera , ASP Tissera and IP Nishantha of the CID who went there began the interrogation , Mahinda gave answers along with a team of his so called legal pundits – ex Chief Justice Sarath N. Silva, Professor G.L.Peiris , Jayantha Weerasinghe PC, Ali Sabry and Ganesh. Even after having this team of pundits with him, Mahinda chose to faithfully follow kudu Duminda De Silva (now in death row) when answering the questions; his answers were either ‘I don’t remember’ or ‘I do not know’. The entire interrogation was tape recorded , and it lasted about 3 hours. Mahinda who took every measure to be non committal when facing the CID however at the media briefing following the interrogation made a grave slip . He inquired ‘ is releasing Keith Noyahr wrong?’ What can be inferred from this is , Mahinda considers abduction is a wrong , but his action of releasing the victim is good. Therefore his statement that he did not know about the abduction is an absolute lie. Another statement made by Mahinda to the media is also full of portents …..
‘This is the vindictive nature of this government . They are thinking that will not happen to them. Without the knowledge of the president and the Prime Minister the CID will not arrive here. They are thinking this will not happen to them too.’ These comments of Mahinda are a clear index that if by any chance he seizes power again , his government will also take revenge on the present rulers. It is to be noted Mahinda was questioned not regarding any political vengeances though he harped on them , but in connection with the abduction of Noyahr , and the phone call given by Karu Jayasuriya (present speaker) a member of Mahinda’s cabinet then to Mahinda at about 11.30 in the night urging him to release Noyahr exonerating him of any charges , and subsequent freeing of Noyahr . Not only in the case of Noyahr , even when Poddala Jayantha was abducted by the white Van , it is only after Mahinda Rajapakse was informed by editor and news editor of Lanka e news , Poddala was thrown on to the road , and abandoned. During that short period of 40 mins. within the Van Poddala was assaulted , his legs were broken , hair was cut and the hair was forced down his throat . It is only when Mahinda was contacted that life was saved . That is Mahinda played the role of a godfather. Those who were provoked , angered and disappointed over the failure to kill Poddala , filed a case on a frame up that Lanka e news editor and news editor were responsible for Poddala’s abduction. Both LeN editors had to face court proceedings for over a year and also visit the Nugegoda police station to sign every week. When even a Tamil journalist Gurparan was abducted , it was only after a powerful personnel of the Free media movement phoned Mahinda the godfather and immediately informed him about it, Guraparan could be released. It was while Mahinda was on his way to the airport to go abroad, he was contacted . Mahinda saying to someone ‘ by 12.00 noon put that fellow out’ was heard over the phone. Don’t all these incidents clearly prove that Mahinda was directly involved with the team which carried out the abductions and disappearances? When that is the true situation , how can interrogating him be a political vendetta? If he is not an accomplice or a culprit , isn’t it his duty to disclose those who committed them , and cooperate with the investigators to bring the criminals before the law? He is alleging this interrogation is a political vendetta, then what about the interrogation of present chief of the national intelligence service of the defense ministry, Sisira Mendis last June by the CID in connection with Keith Noyahr incident , and the recording of his statement ? Sisira was questioned because he was the DIG in charge of the CID during the period when Lasantha was murdered and Noyahr was abducted. Now , Sisira has gone on retirement . The squint eyed Rajapakses who always take refuge in ‘political revenge’ as a defense after being involved in all the criminal activities must explain why was the the chief of the national intelligence unit questioned for 6 hours over that incident ? Is it because CID had nothing better do ? During that nefarious period of the Rajapakses , not only media personnel were made victims , under the pretext of the war even innocent people for no reason were abducted and went missing . Most of those were based on personal reasons and had nothing to do with the war. One example was the abduction of Mohomed Niyaz Salie alias loku seeya the chief kapuwa of Ragama Devale , whose body was later found washed ashore in Trincomalee area. The true picture pertaining to all these ruthless criminal incidents must be unraveled . That is the duty of civilized people who respect the laws , without trying to shout , scream and flee while dismissing these grave crimes by simply saying ‘taking revenge’. A report is to be submitted to the Mt. Lavinia court pertaining to yesterday’s interrogation of Mahinda in this regard on Monday .